Beach means Holiday to me! I just want to create one corner of ATLANTIC CITY beach in my mixed media project. It was my first holiday in America so those day are most memorable days in my life. I saw some treasure box and bottles with note & keys as well as some pennies at one of the corner of the beach so I decided to recreate that scene which is integral part of my memories(not same recreation but I add my own idea to make treasure look.). I used only one shell in my project which I collect from Atlantic City Beach as memory of Beach. I have only one shell which is too big so I want to use it as focal point in my project. 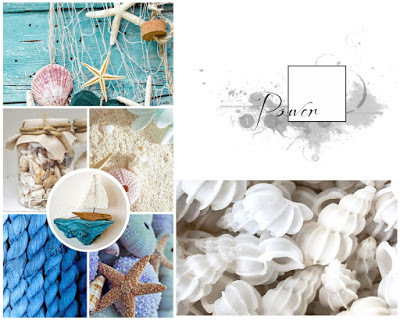 I inspire from the theme of mood board as well as shells , other elements and colors also. its sea theme and I tried to create sea in my project. Thanks for sharing your beautiful creation with us at More Than Words. 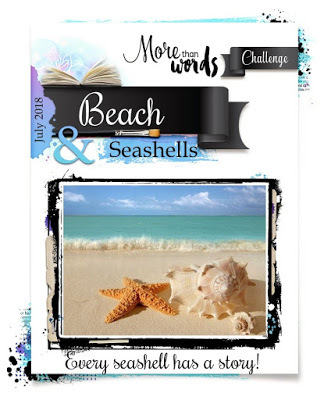 Love the big shell and the little message bottle. Absolutely stunning! No word to describe how much I love this! Thank you for playing along with us at More Than Words! Magnificent creation! What a great idea to use that large shell, it shines and sparkles and is just so wonderfully done! Thanks for joining us at MM&A!